MVC controller returns many types of output to the view according to the data we need for the application. In this article we will learn about JsonResult type of MVC . So instead of going into the depth on the subject, let us start with its practical implementation. It is the type of output format which is shown to the client . 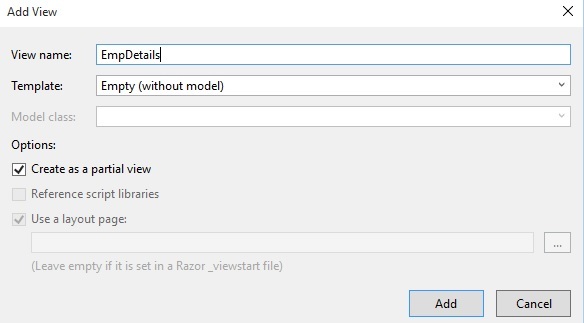 Right click on Model folder in the created MVC application, give the class name employee or as you wish and click OK. In the above controller class JsonResult method EmpDetails we have added the records into the Generic list and returning it as JSON to avoid database query for same result. If you return JSON method without setting JsonRequestBehavior property to AllowGet then the following error will occur. Give the name EmpDetails and click Add button. 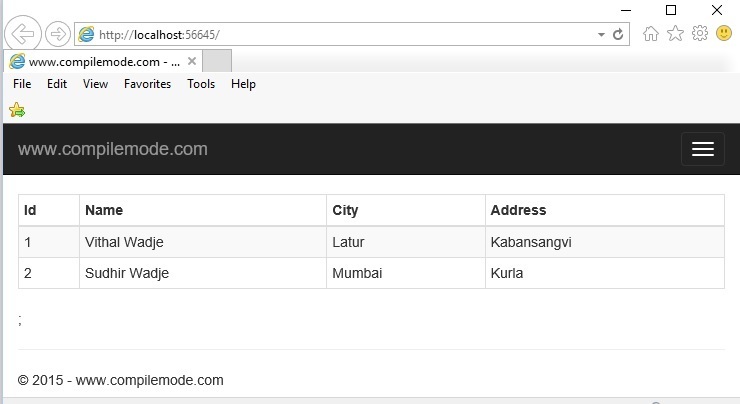 From the preceding examples we have learned about JsonResult type using the scenario on how to bind view using JSON data in ASP.NET MVC. Handle the exception in the database or text file as per you convenience, since in this article I have not implemented it. I hope this article is useful for all the readers. If you have any suggestion please contact me.